These pillow block bearings are heavy duty with double taper roller bearings inside for the best performance in radial and thrust loads. 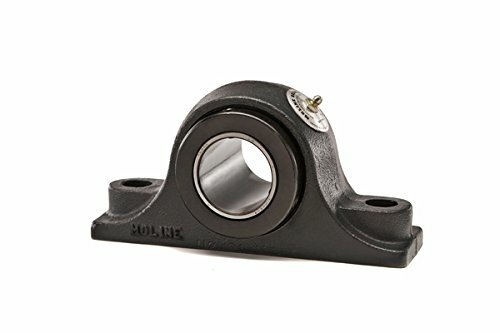 Equal to Dodge Type E pillow block series, these heavy duty pillow block bearings are made by Moline Bearing Co. in the USA. Housings are made of high-quality gray iron. The bearings are genuine Timken tapered roller bearings consisting of vacuum degassed steel which gives rollers and races added life and provides superior load and speed characteristics. The drive collar on each end of inner race comes with 2 headless set screws spaced 65 apart, locking the bearing to the shaft. This design allows for radial and thrust load capacities. This bearings comes completely assembled, adjusted, sealed and pre-lubricated at the factory. The bearings come standard with V-Guard nitrile and Teflon contact seal for extreme dirt and wet environments. If you have any questions about this product by Big Bearing, contact us by completing and submitting the form below. If you are looking for a specif part number, please include it with your message.